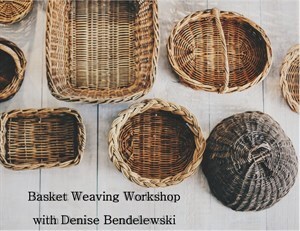 To coincide with the museum’s feature exhibit, "Rooted, Revived, Reinvented: Basketry in America," Biggs’ Delaware by Hand artist member, Denise Bendelewski, will lead a day long basket weaving class. By the end of the class, participants will have learned to make a small market basket. This introductory class is meant for beginners and intermediate students. There will be a break for lunch midday and participants can bring their own lunches. Registration includes all supplies. Pre-registration is required by February 9th. THIS EVENT HAS SOLD OUT - Please call 302-674-2111 ext. 110 to be added to the wait list.